Technical blackground – Polisign Ltd.
We work in our decoration work-shop with Gerber Milling Machine, engraving and laser engraving machines, high performance cutting machines. Vinyl decoration is completed by Fastrack 1300 computer controlled Plotter using vinyl guaranteed for 5-7 years. We make preparation of digital printing and decoration by vinyl for indoor and outdoor purposes. We apply the best quality modern and traditional raw materials for the advertising equipments such as foamed PVC and plexiglass, Alucobond, Dibond and aluminium profiles, aluminium and stainless steel plates, MDF and laminated boards and massive wood according to the demands. The lock-smith workshop makes the procession of steel profiles and plates and aluminium structure using plate shears up to 2500-3000 mm, edge-bending equipment for plates up to 3000 mm, post-bending equipment and CO welders. Custom made, individual parts can be cut by turning-lathe, milling and grinding machine. Homogenization of surfaces for decoration purposes can be made by grit blasting on request. 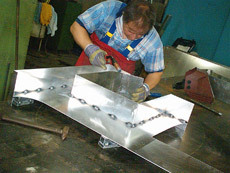 The frames and structures made of extruded aluminium profiles can be epoxy painted, as well. In our assembling workshop the processing of plexiglass can be completed by mechanical milling machine and hot moulding by oven. 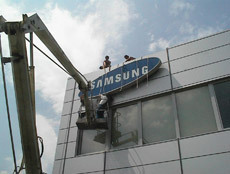 Fluorescent lights, high voltage neon tubes and LED-lights are usually applied. Electrical transformer with short circuit protection and long-life fluorescent lighting tubes are built in the products to avoid failures. We offer normal or low voltage solutions for LED-lights. For outdoor purposes we provide waterproof plastic-covered lights. 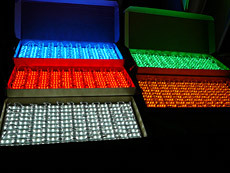 For one colour and RGB LEDs we offer electronics, switches for lightshots. In case of furniture and displays small and safety low voltage LED-lights with low heat-emission can be built in. 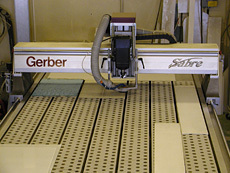 The joinery section can process laminated boards, MDF and massive wood boards on traditional joinery machines. Cutting of boards is made by HOLZ-HER vertical milling machine. 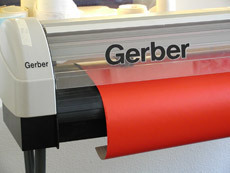 Edge-protection is made by OTT type of machine (using plastic edge cover up to 3 mm or massive wood stripes up to 30 mm). 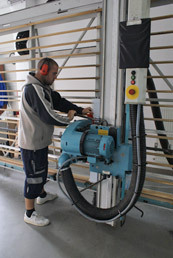 In case of large serial production the boards can be joined by column drill machine with plugging or with dowels in case of smaller quantities. Our Customer can choose fittings, locks of various types. Massive pine or hard wood parts are made by traditional joinery machines (band-sawing machine, trimmer and planner, milling machine and grinder). MDF boards can be milled and painted individually on the request of the Customers. Our well equipped trucks help us to complete on-site installations and maintenance applying stands, scaffolds, cranes and alpine technics, accumulator tools. The transportation, storage or disposal of the advertising equipments for estra costs is possible.